What a gorgeous day and I’m sitting inside writing a blog post about it is and I am sitting inside as the sun is shining through my windows almost blinding me. I haven’t felt such heat in such a long time and it is comforting and also a little bit shocking at the same time. It is not without reason that so many people get sick this time of the year. It kind be a shock to the system to go from cold weather to such warm temperatures. 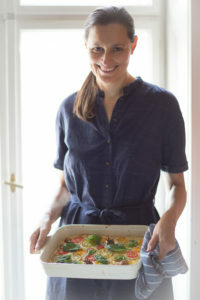 I have to be especially mindful about what I eat at this time of the year and feel a natural pull to all things green. The body is awakening from a long winter sleep even though it hasn’t been really sleeping but I feel that way. I love to hibernate in the winter and stay inside a lot. Once Spring arrives I feel like heading out and being in nature and watching everything magically unfold and become greener and greener. 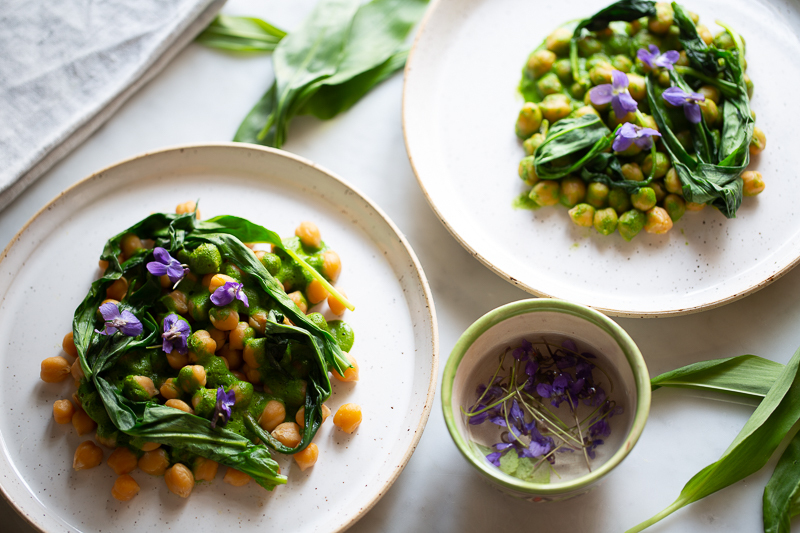 The inspiration for this simple yet beautiful wild garlic and chickpea dish came from being outside and looking for new and creative ways to use the abundance of wild garlic that is growing all over the Viennese Woods. I’m fortunate enough to live in a city that is surrounded by woods and laws here protect as much of the natural habitat as possible. I always say, “I don’t have my own garden but the city garden is mine” and it feels like its there for me to explore and be free. Wild garlic grows almost everywhere in Vienna, even in inner city districts but I like to go out a little on the outskirts of the city where there is less traffic and more nature. Luckily my son’s school is nestled in a large park and when I drop him off I sometimes go to this park for walks. At this time of the year I pick wild garlic. Along the way I also can’t help myself and usually pick violets as well. Did you know that they are edible and have a slightly sweet flavour? I didn’t know until a few years ago and ever since then I add them to salads and cakes when they are in season. What to do with wild garlic? After picking I usually make a big batch of pesto with walnuts, pine nuts or other seeds. Pumpkin seeds lightly toasted make a wonderful wild garlic pesto. Then I add it to soups, in stir fries, quiches or tarts and even savoury muffins. It’s also possible to make little pesto portions and freeze it in an ice cube tray so when your in the mood for some you can simply pop out one cube. Another favourite way to use it is mixed into mashed potatoes or root vegetable purees.When coming up with this recipe I was inspired by an Indian recipe that I really love called Sag Aloo. It’s a potato based dish with spinach and spiced with cumin and coriander. Its really very simple and delicious. 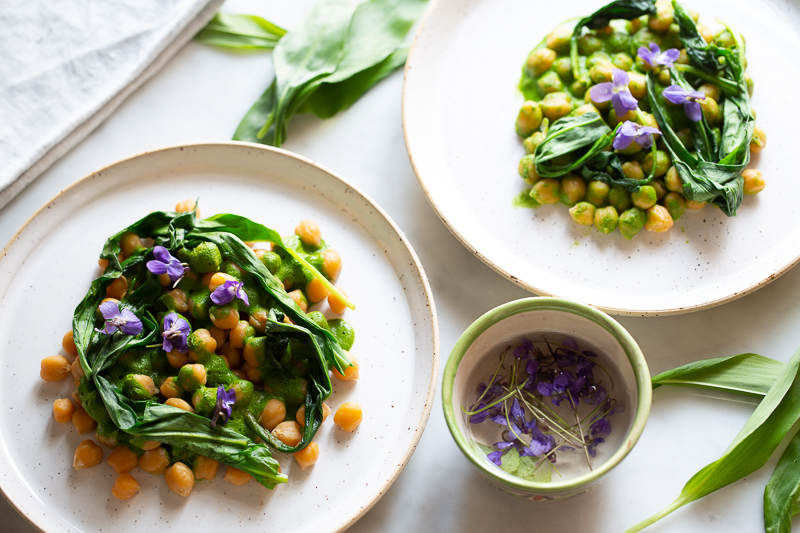 Since wild garlic has a really strong potent flavour I didn’t want to introduce too many flavours and kept it simple replacing potatoes for chickpeas. So, before I get to the recipe I’d love to hear from you. Do you like to go foraging for wild garlic or anything else and if yes, what do you make with it? Please share in the comments below and feel free to connect with me on Instagram or Facebook. If you share this recipe on Instagram don’t forget to tag me #vegan__art. Thanks for stopping by and have a lovely day! In a food processor combine half of the wild garlic, nutritional yeast, cashew, lemon juice, salt and pepper and 150 ml of water. Blend for one to two minutes or until thoroughly smooth. 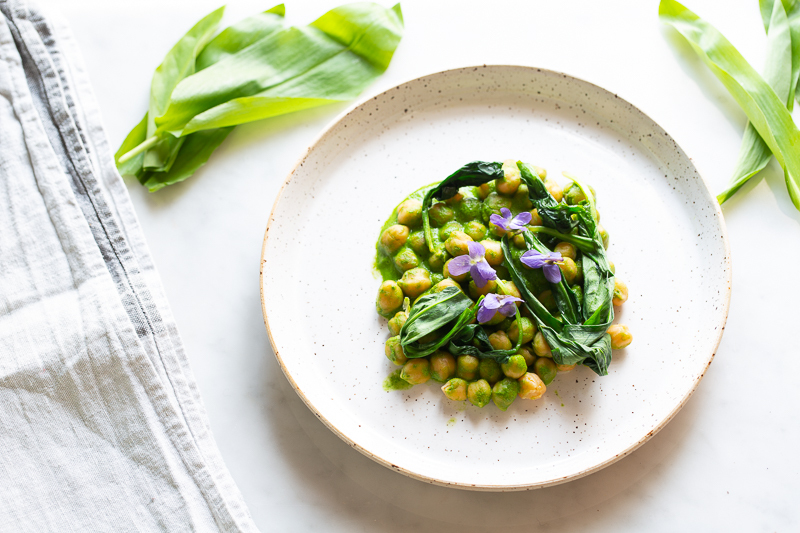 Heat a frying pan and add olive oil to it and add the remaining wild garlic to the pan and add a pinch of salt and cover with a lid until it wilts, about one minute. Add the tamari and incorporate it and remove from the stove. 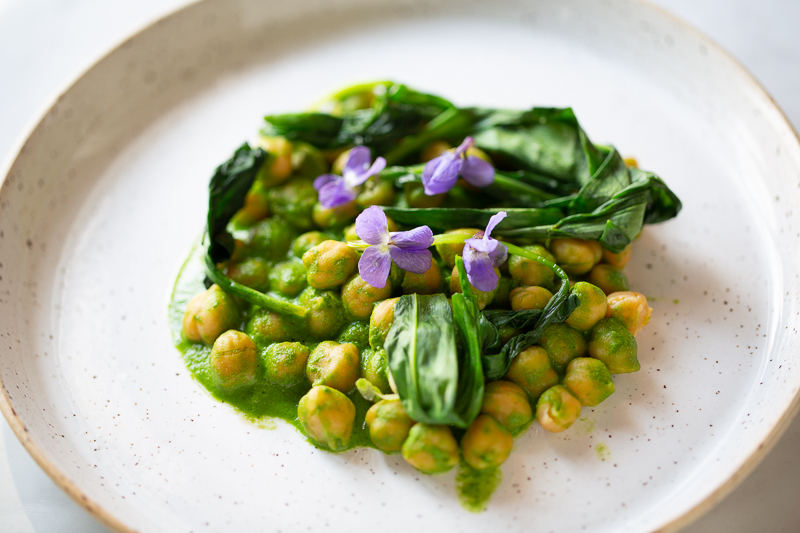 Combine the chickpeas with the puree first and reheat it gently in a large pan and then add the wilted wild garlic to it. Serve with a little extra olive oil and violet blossoms, if you wish.